A BBC television programme due to air next week will investigate pharmacists’ concerns over “workload pressure and patient safety” at Boots, the broadcaster has said. The Inside Out “special investigation” – entitled Boots: Pharmacists under pressure? – has input from a former professional standards manager at the multiple who raised “staffing concerns” before he resigned “more than two years ago”, according to the BBC. In a company-wide briefing sent last week – and seen by C+D – Elizabeth Fagan, senior vice president and managing director of Walgreens Boots Alliance's retail pharmacy international division, reassured employees that the multiple is “aware of the programme and have been talking to the producers”. She added that Boots' pharmacy director Richard Bradley was interviewed for the programme, which is due to air on BBC One in England next Monday (January 8) at 7.30pm. It will air in Northern Ireland and Wales at 10.45pm, and on BBC Two Scotland at 8pm on January 11. Ms Fagan warned Boots employees that “the publicity for the programme may attract some attention from people outside of the business, particularly on social media” and advised staff to direct questions to the multiple's customer care team or press office. A spokesperson for Boots told C+D that “as we have not seen the programme, we are unable to comment further at this time”. The General Pharmaceutical Council (GPhC) declined C+D’s invitation to comment prior to the transmission date. Data from the C+D Salary Survey 2017 revealed that 80% of employee pharmacists are suffering from workplace stress. Catch up with all the Salary Survey coverage here and use our interactive tool below to compare pay and working conditions at the three largest pharmacy multiples. In 2016, a Pharmacists’ Defence Association (PDA) survey revealed that 55% of just under 2,000 employee and locum pharmacists at the multiples feel commercial incentives or targets compromise patient safety or professional judgement "around half" of the time or more. The survey made international headlines after the Guardian used it as part of its allegations that some Boots managers had instructed staff to carry out unnecessary medicines use reviews (MURs). Boots said at the time that it did “not recognise” these claims. The PDA survey and the Guardian investigation prompted the GPhC to launch a "programme of work" to address the issue of workplace pressure and discuss how best to support pharmacists. 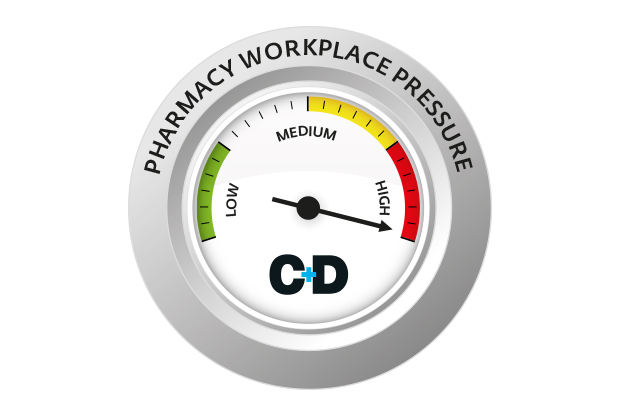 How is workplace pressure affecting your pharmacy? We all know that Boots is not the only culprit. I was in the fortunate position of being able to stop working as a locum in community pharmacy a few years ago and do not miss it for a second. I worked for supermarket pharmacies such as Tesco, Sainsbury and Morrisons. Self-checking was routine and I was constantly battling with department managers who wanted to move the pharmacy counter staff to checkouts as they were incapable of recognising the pharmacy's unique status "in-store". I pitied the full time pharmacy managers who had to work in these conditions daily. I recall one telling me that she had to buy her own paperclips because the store manager would not allow her to get some from the shop floor because it was not in the budget. I sincerely hope that the C & D will not leave it at this, but also investigate why GPhC has blatantly refused to look into this or take any action?! Why shouldn't a regulator that is not fit for purpose also be investigated - that's all our combined registration fees that is doing nothing to benefit our profession! Dont worry about the damage to the reputation of community pharmacy, we dont have a reputation - we are invisible. The general public are aware of the poor working conditions of doctors and that barely illicits a response and they are considered God-like by many. The public want their stuff now and they dont want to pay for it. The closest the government can come to delivering this is the slave like work conditions of the NHS. You want all this solved? Make the public pay the true cost of what they demand. What would this mean in practice? The biggest tax hike in recent memory. You want the care crisis solved? Make the public pay the hundreds of thousands that it truly costs. What would this mean in practice? Make people sell their house and pay for everything they use. Of course this will never happen. Why? Well the general public love nothing more than telling themselves lies and the government are more than happy to go along with it. Mark, you do realise more funding doesn’t necessarily mean better service or more pay in pharmacists pockets, probably more profits for contractors. I am not hoping for more pay or 'better' service (subjective?). I would be happy with regulation that would deal with most eregious examples of excessive workloads. It is now common place to see 500/600 item per day pharmacies running on two staff (sometimes one). Each time it is sickness, holiday or recruitment that is never resolved. I want a minimum of two dispensers per branch as a basic legal requirement, with sickness/holiday/ recruitment never being allowed as an excuse. If you dont have this basic level you should not be able to open the premises. It is a very basic expectation, it is the best we can hope for. I am waiting to see how balanced that programme is going to be. I hope it won’t focus on those low ability pharmacists who can’t cope under any circumstances, or those lazy moaners who are always looking for jobs with no work content. I have crossed swords with those ‘pharmacists’ in the past. It would be interesting to see why Boots deserves this treatment. The Institution that should hold its head in shame is the Regulator, the General Pharmaceutical council. This is the second BBC expose' on Community Pharmacy and there is also the Guardian coverage. The issues raised in all of these coverages are Patient safety issues which this Moribund organisation claim to champion. They claim to have a functional Inspectorate, yet questions are raised now to say , where were they when all this has been happening. The reason why this is not important to them is that they will not investigate anything where the blame is not on an individual registrant. Its so easy to line up a few registrants and use them as their propaganda to say they are protecting the public. Companies and owners who protect their interests through SOPS and unqualified personell are not subject to GPHC regulations. If they are, why is it that we have not read about BOOTS or Lloydspharmacy in the GPHC publication, REGULATE. Yet the same companies have condemned a lot of innocent Registrants to Fitness to Practice procedures. Like clockwork the GPHC always listens to one side, the side of the Multiples, no questions asked. Its a sickening scenario in a Profession which is part of the Medical Field. My local Member of Parliament reacted to the Boots Story by saying, if BOOTS or Lloydspharmacy were O2 oe EE, OFCOM would have revoked their licenses to protect the Public. If they were British Gas, OFGEN would have fined them appropriately to show the public they are protected by the Regulator. The Regulator would not have just punished the individual Engineers, Technicians or Operatives. The reason there is uncontrolled Impunity in Community Pharmacy is because the Regulator does not look at Companies that operate Pharmacies as Legal Persons. Patients get Hospitalised and some lose their lives due to errors in Community Pharmacy and nothing is done to change situations because the people in control of the resources are worried about anything happenning to them. This is why the Department of Health never take us seriously because we can not even police ourselves absolutely to protect the very patients we serve. This Boots story, whichever way ot develops on Monday, is Kindergarten stuff, a walk in the park or tip of the ice berg in terms of the actual picture on the ground. Its actually too ghastly to contemplate where we go from here because we are too dangerous to serve in our current Regulatory format and Professional structure. Have, or will, C&D contribute the 2017 workplace pressure findings to the BBC? It's not just Boots; Well score even worse on most parameters. Let's keep the ball rolling and push for meaningful change. Unfortunately the Guardian MUR exposé resulted in no more than a very brief respite in pressure at the most. I was told about this documantry back in summer of last year but have been unable to say anything. Why put a question mark after the title?? It should read 'Boots: Pharmacists Under Pressure!!!' There is no question at all that ALL multiples (not JUST Boots - all of the other big boys should be tarred with this particular brush) have been making pharmacist's working lives pretty intolerable for years now. BBC will like controversy. Boots or no boots , any publicity of pressurised pharmacies struggling to make a profit with increased workload and reduced income has to lead onto discussion of muddled government policy and wanton ineffectiveness in implementing the potential pharmacist role in the community. They have the power to listen and value our input but not the will. C&D still don't actually believe all the overwhelming evidence from pharmacists that Boots is not a great place to work. I fully expect it will be a programme which highlights real and true issues but that will allow one or more Boots spokespersons to come on and say "we don't recognise this situation.....", " all our staff can can raise their concerns at any time with their area managers.....", " nobody should feel that they are under any pressure to meet targets at Boots....", "we provide support to all our staff...", "we would never compromise patient safety by issuing MUR/NMS targets" etc etc etc. They will no doubt say that the claims of their former Professional Standards Manager are those of a disgruntled ex-employee. I still know several Boots pharmacists and, round the dinner table, they tell it how it is......a nightmare of targets, threats and cover ups. That, of course, would be the rehearsed lines taken by any large company. Whether anyone will believe the Boots spokesperson/drone is another thing. Notice that the GPhC has declined to comment, and Boots is trying to get in touch with the documentary producers prior to broadcast? This is what it takes to actually frighten these bed fellows. The GPHC are complicit so obviously cannot comment. While I sympathise with the comments on here that this will have unintended consequences, this is also a way of highlighting just how powerless and useless the regulators are as well. More tha a year ago, the GPhC had ample opportunity to pull Boots into line - they didn't. So, I am hoping this programme will also highlight how the regulator is no longer fit for purpose! Unfortunately this is the only way that the plight of pharmacists can be highlighted. About a year ago, Mark Koziol from the PDA was supposedly interviewed for input into some kind of pharmacy documentary. Wonder if this programme will feature any input from the PDA? Here's hoping it's as damning as it can be. Good to see the lift is geting lifted on Boots at last. infroming head office is as good as a resignation letter. Great for the public to see what is really happening, hope Boots get a good "kicking" in this documentary and that the mud sticks, just a shame the employees and other none Boots pharmacists may be badly thought of by the public, myself included. Just left Boots as under too much pressure,am in a lucky position that I can afford to quit at 56 .Such a shame what was once a Great company to work for has gone to the dogs.Not had a pay rise for 3 yrs as pay bands narrowed and comment from regional manager was if you don't like it leave !! Congrats. Enjoy the rest of your life. This has been going on well before the cuts of the last 2-3 years. Too many companies (boots included) set targets that are out of employees hands. Can't wait for the public to find out what a monster Mr Pessina has turned Boots into. The 'cuts' were simply a timely excuse for them. Boots PR machine will kick in to overdrive in the coming days and weeks no doubt. Just long enough for everything to blow over. Nice to see the the hapless employees have already been gagged. Well Boots want to make profit like the rest of us. What do they expect with the cuts? More staff on duty? It’s pretty simple- take away the pharmacy sector’s deserved remuneration and ultimately everyone suffers. It’s laughable that they are questioning ‘should contractors be able to determine number of staff?’... erm we don’t have enough to pay the staff!! You only have to look at their tax record to see, it's not just about the money. I too am concerned that IF there is the mention of pressure to hit the MUR targets, the rest of us will face tough times getting patients in for MUR’s as patients may view us with suspicion. Why does everything recently seem geared to undermine pharmacists and pharmacy?